RAILWAYS owe their existence to the horse - super-speed travel on the railways is attributable to the motor-car and the aeroplane. Two such sweeping statements obviously need explanation. Taking the first - horses were formerly employed in hauling coal wagons along the roads from colliery to canal, whence the mineral was distributed by barges. It was found that horses could haul more wagons if the latter ran on iron “plate-ways” or “rail-ways”, which were accordingly laid on the roads. After having lightened the load of the horse, man sought to effect further economies and the steam-engine was developed to replace the horse on the railways, ultimately reaching a state which permitted the conveyance not only of goods but also of passengers at quite a high speed. Next followed over a century of progress and improvement, culminating in the great luxury expresses of to-day, travelling at speed across continents. Progress, of course, has not been limited to locomotives. The advances in motorcar and aeroplane design have made possible even higher speeds and greater comfort in railway travel. Both the motor-car and the aeroplane embody methods of construction which have now been applied to an entirely new type of railway train. The main features of these new high-speed trains are accordingly lightness in construction, the use of internal combustion engines and particularly of Diesel engines burning heavy (and cheap) oil, and streamlining. 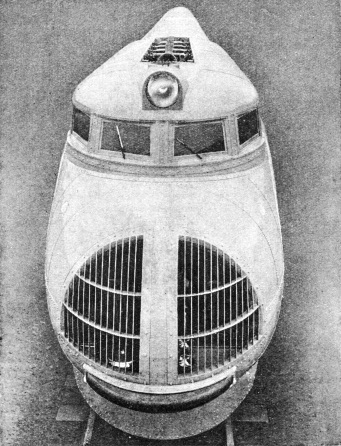 The streamlined aeroplane or vehicle opens for itself a clear passage through the air, which closes behind it with a minimum of retarding effect. Railway companies throughout the world are now able to make the best use of their smooth and level tracks by providing the travelling public with an entirely new type of passenger train. Particularly interesting expresses built on the new streamline principle are in service on the Union Pacific Railroad in the USA. The first of these trains comprised three carriages, electrically driven, current being generated by a 600 hp internal combustion engine in the leading coach. Only 500 hp is required to propel the train, which weighs 85 tons, at a speed of 90 miles an hour with a load of 116 passengers, its crew and some 11 tons of mails and luggage. A typical American steam train of ten coaches, weighing 1,000 tons, would require 4,500 hp to attain the same result. The light weight of the new train was obtained by a radical departure from conventional construction, aluminium alloys being substituted for steel, this giving equal strength with only one third of the weight. AT NIGHT TIME the streamlined train lights the way with a powerful electric searchlight, in addition to which a vertical beam of light gives ample warning of approach to motorists and pedestrians at level crossings and the stretches of unfenced track found on American railways. These headlights will penetrate fog, dust and snow, providing additional safety during high-speed travel. The streamlined design was determined as the result of a series of scientific tests with scale models in a wind tunnel - a large cylinder through which air is blown mechanically at different velocities representing various speeds of the models under observation. During the tests progressive changes of the contours of the front and rear ends of the models were made in order to evolve a shape offering the minimum resistance to the current of air. In place of the usual steel underframe of most passenger coaches, which carries the superstructure and the load, each carriage in the new train is tubular in shape and the entire coach body forms a deep, stiff beam, thereby requiring a minimum of material for a given strength. The coach bodies are composed of two principal structural elements, namely, the extruded aluminium alloy frames, in combination with the aluminium alloy plates forming the outer and inner sheathing. Between these sheaths is a two-inch space containing a lightweight fireproof insulating material. Quite briefly the new train is a flexible tube of metal mounted on wheels. The train has a total length of 204 ft 5 in, the power, mail and baggage coach being 72 ft 8 in long; the middle coach is 59 ft 10 in long, the third coach measuring 71 ft 11 in. The design of the new train is such that it hugs the rail in the same manner that a low-slung motor-car hugs the road. The bottom of the coaches is but 9½ in above the rails, while the roof is only 11 ft above the rails - approximately 2 ft lower than in the usual American passenger carriage. The passenger is consequently seated much closer to the ground than in the conventional train, and the centre of gravity of the coaches is lowered accordingly. Articulation between the body units of the train was adopted as best suiting the requirements for high speed and smooth riding. In brief, articulation consists in having one bogie-truck between each two coaches which are thus hinged together. The usual type of railway carriage has two complete bogies, one at each end. Articulation prevents, except to a very limited degree, the independent swaying of each individual coach, thus tending towards a gliding motion for the entire train. It will be seen that a three-coach train, if articulated, can be carried on four trucks instead of six. There are four wheels on each of the four bogie-trucks on the train. The wheels on the front, or power bogie, are 36-in diameter, and are equipped with roller bearing journals. The wheels of the other three bogies are all 33-in diameter and also run in roller bearings. The main power plant of the train consists of an internal combustion engine directly connected to a generator supplying electricity to two motors mounted on the forward bogie of the first coach. The engine is of the 12-cylinder V-type, rated at 600 hp. The entire engine frame, including the crank case and cylinder water jackets, is of welded wrought steel. The electric generator, rated at 425 kilowatts, supplies power for two traction motors, each of 300 hp, one being mounted on each axle of the front bogie-truck. In addition to the main generator there is an engine-driven auxiliary generator having a capacity of 25 kilowatts, which supplies current for battery charging; for one of the two air compressors (the other air compressor receiving its power from the main generator); for the air conditioning apparatus; for the lighting equipment and for refrigeration in the buffet. Another engine-generator set, of 8 kilowatts capacity, is carried in the baggage compartment for service when the main power plant is shut down. The entire power plant, including all auxiliaries, storage batteries, accessories and apparatus, weighs approximately 20 tons. By way of contrast, a Union Pacific steam locomotive, used in regular passenger service, weighs 316 tons. The internal combustion engine of the train uses heavy fuel oil instead of petrol or other spirit, so that all risk of accidental explosion is removed. The fuel tanks, with sufficient capacity for a 1,200-mile run, are built into the structure and under the floor of the power coach. This diagram shows the tubular construction of the streamlined train. In conjunction with the pneumatic system is an electric circuit actuated by contact points on the driver’s brake valve and operating a magnetic control device on each pneumatic brake valve. This not only synchronizes but also accelerates all brake applications and releases. An important feature of the super-brakes is an appliance called a “decelerometer” used for regulating the slowing down of train speed. It equalizes the pressure on the brake of each wheel of the train. When the train is being slowed down or brought to a stop it maintains the highest possible pressure on each wheel and at the same time prevents the wheels from sliding. The brakes cannot lock as they do on a motor-car when too much pressure is exerted on the foot pedal or by the hand brake. The super-brakes not only provide complete control of the train while it is in motion but also, through another automatic device, actually prevent the train from starting out from the station unless the entire braking system is in perfect working condition. This revolutionary feature makes it possible for the driver to know beyond any possible doubt that whenever the train is in motion the braking system will do what he expects it to do. By the use of the decelerometer control it is possible to stop, even from exceptionally high speeds, in a shorter distance than is possible on slower steam railroad trains and without the slightest discomfort to the passengers. A plan view showing how the three coaches are hinged together, so rendering the train flexible for negotiating curves. The motorman, or driver, with all his controls and necessary instruments, is provided with an elevated cab above the rounded nose of the power coach. The cab is separated from the main engine room by a metal partition with a door that opens directly on a platform overlooking the power plant. From his elevated position the motorman has a much greater visual range than does the driver of a steam locomotive. His outlook includes the entire area on both sides and in front of the train. He is also removed from the noise of the engine room. The main operating controls in the cab consist of first, the throttle, which governs the speed of the engine itself, much as pressure on the accelerator on a motor-car increases the revolutions of the engine; second, the controller by which the motorman increases or decreases the speed of the traction motors which drive the train; and third, a valve for control of the brakes by means of which the train is slowed down or brought to a stop. A RECORD RUN. 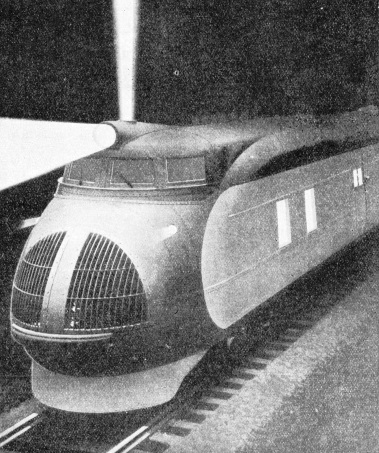 The first American streamlined train to cross the continent from Los Angeles to New York in just under 57 hours at an average speed of 62 mph. This train is of the six-car type, with a 900 hp engine, and is claimed to have touched a top speed of 120 mph. The motorman, when the train is running, is seated on the right side of the cab. In a corresponding position on the left side of the cab is a dual set of the controls for the use of a second man. The brake valve is equipped with a “dead man” handle and pedal, necessitating the motorman’s keeping either a hand or a foot on this control while the train is moving. If for any reason the motorman accidentally relinquishes control, there is immediately an automatic closing of the throttle and application of the brakes. Electric signals afford communication between the train crew and the motorman. A powerful horizontal headlight of special construction is streamlined into the roof of the motorman’s cab. Immediately behind this headlight is an additional headlight with a 10-inch vertical light beam to give visual warning of the approach of the train. A powerful siren with a long audible range is used for high speeds, supplemented by the usual type of siren and a large electric gong for use through towns. On the instrument board before the motorman is mounted a sensitive speedometer, electrical instruments, oil-, air- and water-gauges and light-controls. The side doors of the train, when closed, form a part of the smooth exterior contour of the coaches. The doors are interlocked with steps that fold up when the former are closed. A flush trap-door inside the car closes down on shutting the door. The new train is fully air-conditioned; a forced ventilation system, heating the train in winter and cooling it in summer, filters all dust from the outside air, and, by the use of sealed windows, maintains sufficient pressure in the coach to exclude all dirt. The ventilating system is so perfectly controlled that smoking is permitted in all parts of the coaches without any discomfort to adjacent passengers. The air conditioning is accomplished by the distribution of filtered air, cooled or heated as desired, through a system of ducts by means of power-driven blowers. These ducts extend the full length of the coaches, with flexible insulated connexions between the coaches. The heating and cooling ducts are so arranged that when either is used for delivery of air to the coaches, the other is used as a power-driven exhaust, thus positively controlling both input and output of air at all times. Temperatures are controlled by means of thermostats - devices similar to those which automatically adjust the heat of modern gas cookers. There is a duct carried throughout the train on each side below the floor level and a central ceiling duct which forms a part of the interior design. A radiator outlet is adjacent to each seat and air is expelled through a corresponding outlet in the ceiling duct so that a definite circulation is obtained at each seat unit. The windows are sealed in rubber and are set practically flush with the outside of the coach to minimize wind resistance. T he lighting system is indirect, the electric globes being con-cealed in an aluminium panel running the entire length of the coach ceiling. Light is reflected on each side against the curved ceiling, so that illumination is evenly distributed for reading. The lights are so arranged that three intensities are obtained, the lowest intensity being for night lighting while passengers are sleeping. The interior decoration is of striking but simple design. The colour scheme is blue, shading down progressively from nearly white at the top of the vaulted ceiling, through the lighter shades of blue to a dark blue colour below the window sills. Horizontal lines of aluminium show between the different shades of blue, and trimming on the chairs is also of aluminium. Window sills are of black bake-lite, and chairs are upholstered with a golden brown tapestry. The windows are provided with Venetian blinds, and the floor is of cork tile with a coloured carpet aisle strip. The new train will seat 116 passengers, 60 in the middle coach and 56 in the last carriage. The seats are arranged in pairs on either side of the aisle, each seat having individual adjustment to four positions, the lowest being for sleeping. The seats are equipped to hold trays for taking meals or for writing. The space beneath the seats is kept clear to provide storage space for baggage, the overhead baggage racks of the conventional train having been eliminated. 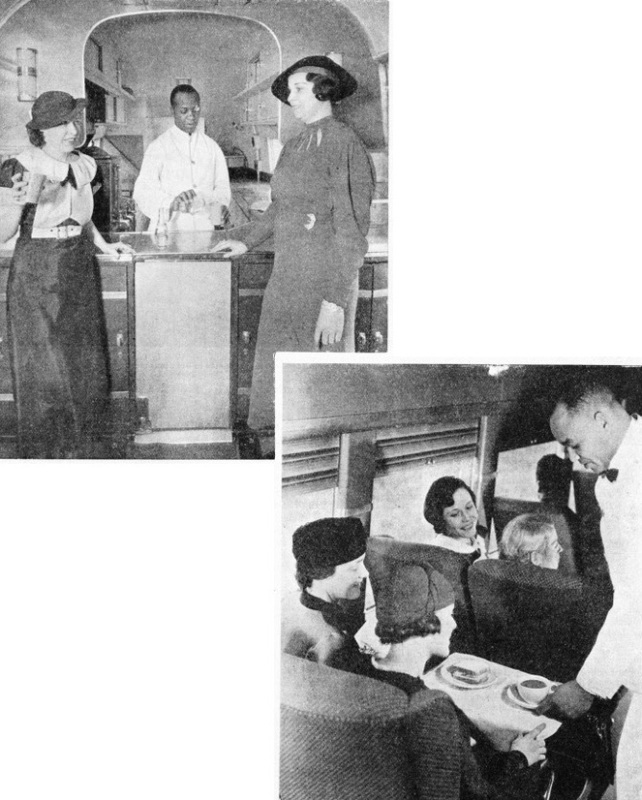 A novel feature is the buffet kitchen which is built into the tail of the last coach. This is replete with space-saving devices tor the preparation of light meals. On one side is a refrigerator box tor carrying ice creams, cooling drinks and the like, and on the other side are two coffee urns, a grill and other cooking apparatus. An electric ice box is built directly into the entrance end of the coach. Meals are served from a special dinner-wagon, its top comprising a steam-heated table, with lower shelves for dishes, silverware, and linen of a special weave. The dishes in use on the train, instead of being china, are made of special composition, very light in weight, and gaily coloured. It is noteworthy that the total weight of the dining service of the train is only 189 pounds, against a weight of 530 pounds for a similar service in china, a saving of 341 pounds. The floors of the coaches are of aluminium alloy plates, built into and forming a part of the structural work. These plates in turn are covered with a composition flooring on top of which the final flooring of cork tile is laid. SPEEDING ACROSS A CONTINENT. America’s first Diesel-electric Express has opened up a new era in railway travel. This wonderful train, built in the form of a huge aluminium tube, is a marvel of lightness and speed, offering to passengers the greatest possible comfort in travelling. A very important and interesting feature which has been introduced into the construction of the train is the use of safety glass for all windows. This glass is impervious to the ultraviolet rays of sunlight, so that one can sit in the sunlight in the train all day without experiencing the discomfort of sunburn. The windows are sealed with rubber and are practically flush with the exterior contour of the train, to reduce wind resistance. The windows in the driver’s cab are also of safety glass and are equipped with wind-shield wipers, automatically operated. Two wash and toilet rooms are built into the ends of each coach. The most modern type of sanitary equipment and fittings are installed. The wash-stands are of white metal. In the women’s toilet-room there is a large built-in plate glass mirror and dressing-stand with all necessary fittings. Wash-stands and toilet-rooms are also installed in the first car of the train for the use of members of the crew. In the front coach of the train, in addition to the engine-room, are mail and luggage compartments. The mail compartment is 33 ft long, and, in addition to the various racks and facilities for handling and sorting mail, an improved mail-bag-catching device for picking up mail without stopping has been installed. The luggage compartment is immediately behind the mail compartment and takes up the remaining space of the first car. It contains the usual facilities for the careful and safe handling of luggage. Doors of both the mail and luggage compartments are flush with the exterior of the train while it is in motion. The mail and luggage doors are very wide, and are opened by a special device which first moves the entire door inward several inches and then slides it open lengthwise of the train on the inside. Windows, also of shatter-proof plate glass, afford ample daylight in both compartments. The tests carried out with this tram were rigorous in the extreme, a tour of some 13,000 miles having been accomplished with very gratifying results. The route which was followed took the train over the rails of fourteen different American railroads in twenty-two different States. It successfully negotiated the gradients and curves of all of these lines and crossed all the important mountain ranges of the country. It was subjected to every sort of weather condition in all altitudes to above 8,000 ft - blizzards in the east and temperatures above 90 degrees on the Pacific coast. Snow, wind, rain and dust storms were all experienced, but the train conformed continuously to the time-tables of the fastest trains on the several railroads over which it passed. THE CONTROL CABIN of the Union Pacific Streamlined Express. This cab, situated in the front of the train, contains all the control mechanism. The lever in the immediate foreground is the throttle of the Diesel engine, and at the right of the cab is placed the air brake control. 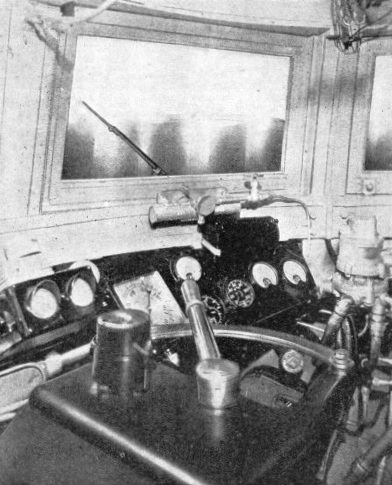 The motorman sits between these controls with the instrument panel before him, a clear view through the safety glass windows being ensured by large windscreen wipers. The first train built to the new design proved so successful that the capacity of a second train has been increased to six coaches, three of these being Pullman sleeping cars. The power unit is a 12-cylinder V type Diesel engine of 900 hp giving a running speed, as with the first train, of 90 mph with a maximum which in favourable conditions is expected to reach 120 mph. Subsequent trains are powered by 1,200 hp 16 cylinder Diesel engines. The 900-hp train consists of six coaches, a power car 48 ft long, a mail and luggage van 64 ft in length, three 64-ft Pullman sleeping cars, and a buffet-coach, 72 ft long, giving a total length of 376 ft. The larger train resembles the first three-coach train in general construction, the six carriages being articulated, and carried on seven bogies. The first two bogies are each driven by a pair of very powerful electric motors, current for which is supplied by the Diesel engine units. Aluminium is, of course, used tor the tubular body-work of the train, the unladen weight of which is only 184½ tons. The weight when fully loaded with luggage and a complement of 124 passengers is 211 tons. The special braking arrangements of the first train are also applied to the larger express, and tests have shown that it can be stopped in 900 yards, even when travelling at 90 miles an hour. A steam train at only 60 miles an hour requires a run of 1,000 yards before the application of brakes will bring it to a standstill. The Pullman cars in use have been specially designed for the streamline trains and constitute a great advance in luxurious travel. 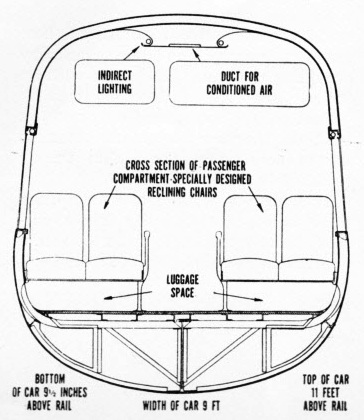 Two of the cars on the express each contain 10 sections (20 berths), with one compartment and one bedroom. The other type of Pullman has eight sections with a compartment and bedroom. STREAMLINING IN BRITAIN. The Great Western Railway has put into service a special car designed to run at 60 miles an hour and weighing 20 tons. The under frame is 60 ft long, with a width of 8 ft 2 in. The car is carried on two 4-wheeled bogies, and is driven by a 130 hp heavy oil engine with a fuel consumption of 10 miles to the gallon. There is accommodation for 69 passengers. 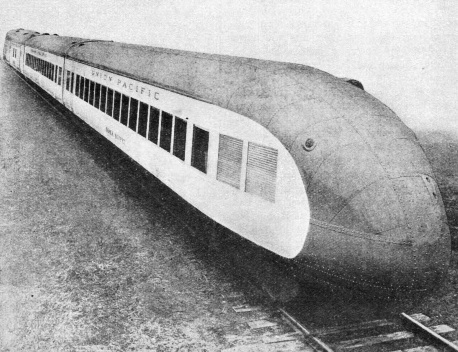 THE ”FLYING HAMBURGER", the fastest train in regular service in the world. Comprising two articulated coaches with seating accommodation for 102 passengers, the train covers the 178 miles between Berlin and Hamburg at an average speed of 77 miles an hour with a maximum speed of 99 miles an hour. The power unit consists of two 410 hp Diesel engines, driving generators supplying current to the electric motors of the train. HIGH-SPEED TRAVEL has received much attention in France, and this picture illustrates the “Bugatti Express”, on the Paris-Lyons-Mediterranean Railway. This remarkable train consists of two cars, each carried by two 8-wheeled bogies, the power being derived from four 8-cylindered Bugatti petrol engines each developing 200 hp. The fastest start to stop schedule of this train is at 71 miles and hour from Laroche to Bijon. An interesting feature is the provision of two sections in each sleeping coach which are six inches longer than normal for the accommodation of passengers above normal height. Each berth, both upper and lower, has individual wash-stands and adjustable illuminated mirrors. The upper berths are reached by separate folding steps with small platforms on top, on which the passenger can stand while dressing. All berths when in use are enclosed by sliding aluminium panels, making them in effect small compartments. The Pullman cars are also provided with separate dressing-rooms, three for men and two for women, in each coach. The new system of air conditioning is provided and each berth is separately ventilated. The seats are all adjustable and are fitted with movable arm-rests and reading-lamps. This remarkable train broke all railway records in October, 1934, when it covered the 3,259 miles between Los Angeles, California, and New York in 56 hours 56 minutes. The time for this journey by the quickest steam trains is 84 hours. An average speed of 82 mph was maintained over the 508 miles from Cheyenne, Wyoming, to Omaha, Nebraska. 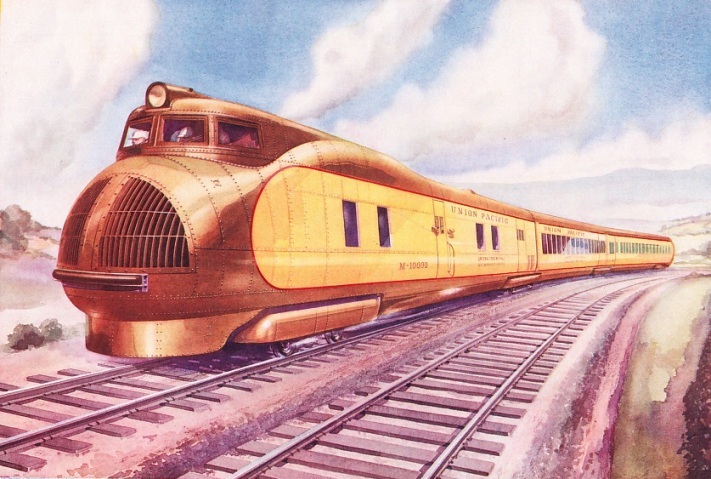 THE ROUNDED NOSE of the Union Pacific streamlined train. The two openings covered by grille work are the air intakes to the engine radiators placed just below the engine-room roof. The upper part of the radiators, together with the engine exhaust pipes, can be seen behind the electric head-lamp. Air for the ventilation system is also taken in at the front of the train. It was on this section that a maximum speed of 120 mph was claimed, though this was based on the approximate statement that two miles were covered in one minute. From Los Angeles to Chicago, including the transit of the heavily-graded section through the Rockies, the time of 38 hours 47 minutes for the 2,299 miles - averaging but a shade under a mile a minute - beat that of the fastest Santa Fé flyer by 20 hours, although including stops of 23 minutes at Salt Lake City and 38 minutes at Omaha. 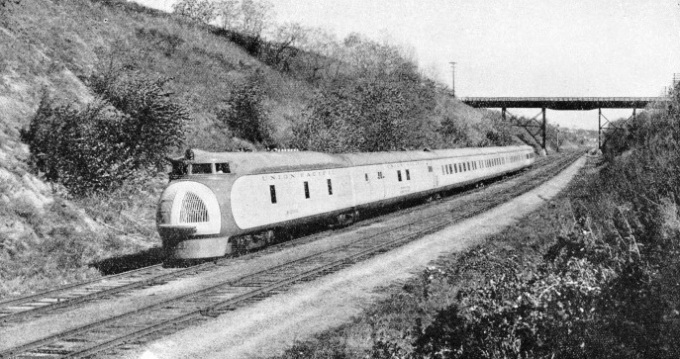 After leaving Chicago, where 40 minutes were spent, the speed of the streamlined express was limited to that of the steam-hauled “Twentieth Century Limited” of the New York Central lines, however, so that 17 hours 25 minutes were spent over the final 961 miles, reducing the ocean-to-ocean average speed to 55.2 mph. Previously the quickest time ever achieved from coast to coast was by a special run in 1906 for Mr. E. H. Harriman, which covered the distance from Oakland, California, to New York in 71 hours 27 minutes. So the new record has cut below the old by the astonishing margin of 14½ hours. STREAMLINE. The design of the tail constitutes the most important feature of the streamlining. Note how the coach tapers almost to a point as in racing cars and aircraft. It is estimated that operating costs are from forty to fifty per cent less than for ordinary steam expresses. The steady development of light-weight, streamlined trains and rail cars has also engaged the attention of railway engineers in Britain and on the continent of Europe. Diesel-electric and petrol-driven trains have been tested in many countries, in most instances with very gratifying results. France and Germany have established some very fine records with high-speed trains. In Britain also the use of rail cars has proved their worth, particularly on branch lines where fast and frequent services can be maintained at reduced cost. 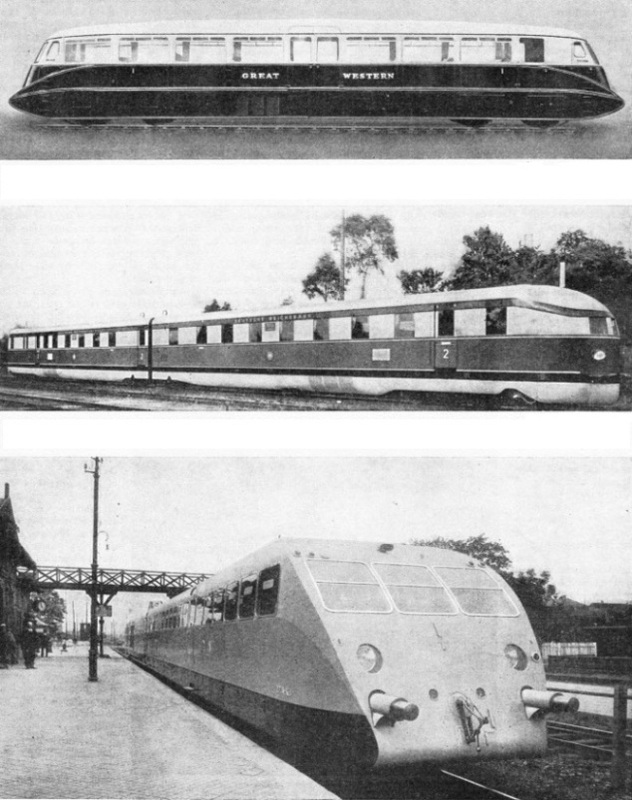 Pictures of the Great Western Railway’s streamlined car, of the Flying Hamburger and the French Bugatti Express are shown on this page, and details of these will be found in later chapters. 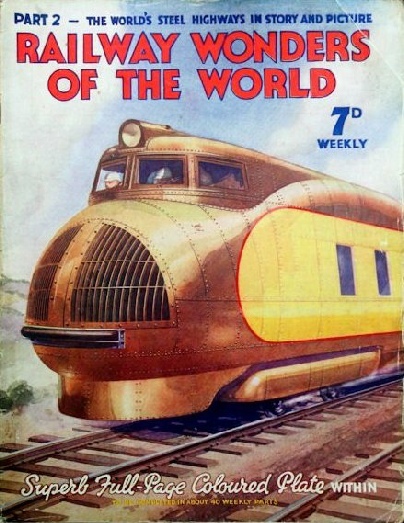 You can read more on “British Diesel Rail Coaches”, “The Rail-Cars of France”, and “The Flying Hamburger” in Railway Wonders of the World. THE KITCHEN BUFFET, which is built into the end of the last coach of the train. The traveller can obtain occasional refreshments at the counter. LIGHT MEALS are also prepared in the train kitchen, and passengers are served on little trays which can be attached to the seats, as seen right. The trays can also be used for writing and are readily removable when not required. The backs of the seats are adjustable, and foot-rests add to the passengers’ comfort.